Have you got an itch? To start your own business, go to the North Pole, retrain, lose weight, get promoted, learn to play the ukulele? Or do you just have a nagging sense that there must be more to life? If there is something you really want to do, but secretly fear you'll never do it then you need this book. The original Stop Talking Start Doing helped readers to move from talking to doing. To climb into the ring and face their fears about making their thing happen. It helped readers to understand why they had fears and why starting was easier than they thought. It encouraged them to start somewhere, anywhere. 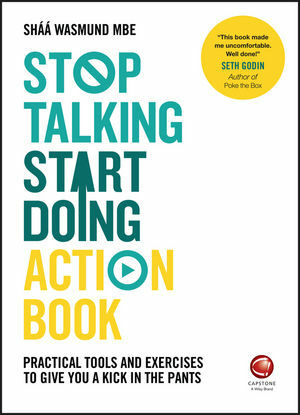 The Stop Talking Start Doing Action Book will help you to identify where or what that starting point should be, and how to build from there to make your thing happen. It will help you to evaluate why you have procrastinated until now and identify the small steps you need to take to make it happen. But it will help you to plan beyond that. It will help you see how you can execute your idea through small, simple steps that are right for you, rather than one undefined, daunting task. Find sources of inspiration that work for you and learn how you can draw upon them as you go, draw confidence from previous experiences, and find the self-discipline you need to make swift decisions along the way. Shaa Wasmund MBE (London, UK) is founder of the UK's number one resource for small businesses and entrepreneurs Smarta.com, a bestselling author, entrepreneur and keynote speaker. Shaa was born in the US and raised in the UK so calls both places home. She has founded several businesses and worked with some of the world's leading entrepreneurs (including Sir James Dyson and Sir Bob Geldof). She is fanatical about social media and digital in small business and created the 'Smarta Business Builder' a groundbreaking cloud-based toolkit for business. She speaks prolifically (weekly) at events with a wide range or audiences sizes. She runs her own live courses, events and retreats and has also launched a series of online courses via the Groupon website. She has won many accolades, including being of the Institute of Director's Most Connected Women, and this year has been granted an MBE by HRH The Queen for her services to business and entrepreneurship. Shaa's previous book with Wiley, Stop Talking, Start Doing, and was the #1 Business Book in retailer WHSmith for over a year - an unprecedented achievement for any title they've stocked.